Of all the herbs used medicinally, Slippery Elm is probably the most well-known and frequently used. It was essentially the food and medicine of the American pioneers and the American Red Indians, but has become over the years one of the finest and most valued remedies in the herbal world. 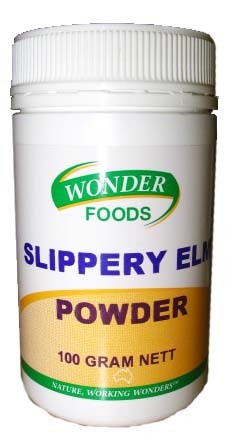 Slippery Elm contains a constituent called mucilage, which accounts for its emollient and demulcent properties. The herb is also nutritional. It can be used to relieve irritated and inflamed conditions of the gastrointestinal tract. It is also considered a bulk laxative as the mucilage absorbs water. The result of this is that the herb swells in the intestine, forming an increased faecal mass that asserts pressure on the walls of the large intestine, helping to initiate a bowel movement. It is important to drink plenty of water, especially if using it for this effect. A traditional ‘mucilaginous’ herb which may help to soothe an irritated or unsettled stomach. For adults: take five grams (1 heaped teaspoon) in 250mL of water three times daily. Drink plenty of water throughout the day.